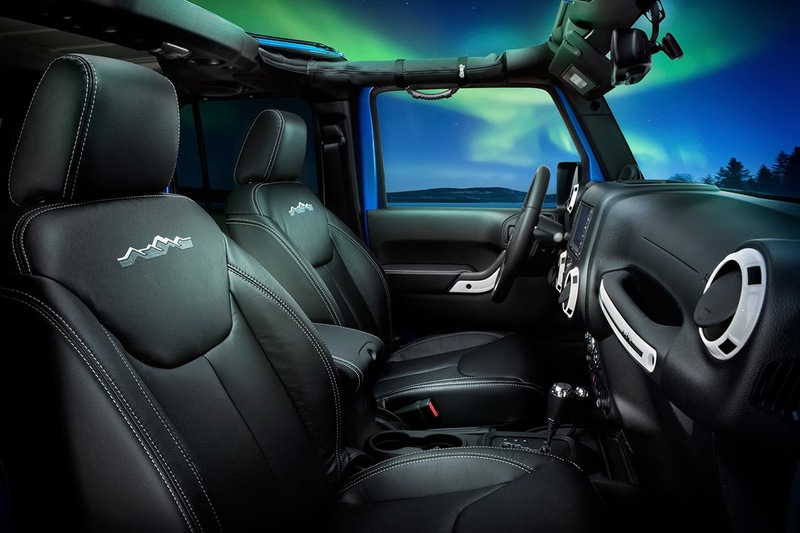 The new 2014 Jeep Wrangler Polar Edition takes inspiration from the severe climate and extreme conditions that characterize the Antarctic region. Jeep Wrangler Polar Edition was designed to express the freedom of going beyond the known limits to venture into unexplored territories: an experience that only Wrangler enthusiasts can enjoy, thanks to the reliability and safety granted by a vehicle featuring benchmark technology and unmatched off-road capability. With its hostile routes and severe climate, the Antarctic region offers the driving conditions that the iconic Jeep Wrangler was engineered to conquer. The "Polar" badge, located on the vehicle’s side next to the front fender flares, exhibits the 78° S and 106° E coordinates that correspond to the location of Vostok in Antarctica: the exact point where the absolute severest temperature in the world was recorded at -128.56° F (-89.2° C). Featuring exclusive styling cues, 18-inch Gloss Black alloy wheels, and a body-color hardtop, the new Jeep Wrangler Polar will be available in both two- and four-door Unlimited versions. 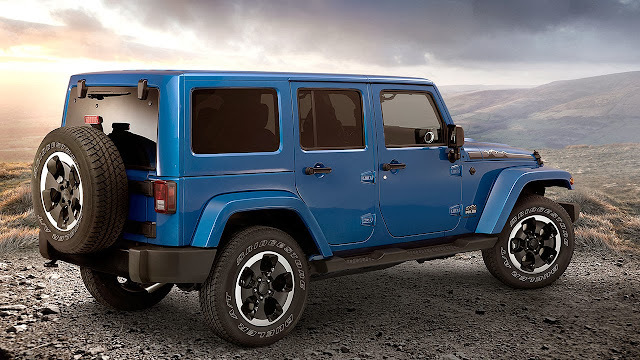 Based on the Jeep Wrangler Sahara, the exterior of the new Wrangler Polar Edition boasts unique features such as the new front grille, Powerdome hood and the body-color hardtop with deep-tint sunscreen glass. A Gloss Black Jeep logo above the front grille and Gloss Black 18" alloy wheels enhance the distinctive look of the vehicle. 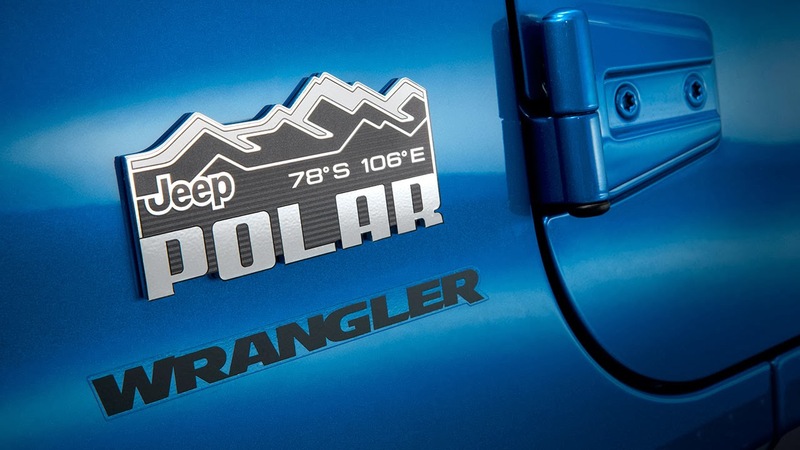 Completing the exterior appointment of the new Jeep Wrangler Polar Edition is the unique, three-color hood decal, featuring the outline of mountains, and the black fuel-filler door from Mopar. The interior features Black heated leather seats enhanced by Pearl White accent stitching and “Polar” logo embroidered on the upper portion of the backrests. Standard equipment also includes a black leather-wrapped steering wheel with Pearl White stitching and high-gloss Ceramic White painted bezels. Pearl White accent stitching is found also on the door armrests and center console lid. The passenger-side dashboard grab bar and dashboard vent rings are finished in high-gloss Ceramic White to create the contrasting effect of the light on Antarctic glaciers. The exclusive cabin of the Jeep Wrangler Polar special edition also features an all-new cluster overlay with rings painted high-gloss Ceramic White and surrounding a blue instrument background with “Polar” logo. Mopar tread-pattern slush mats complete the interior appointments of the new Wrangler Polar Edition. 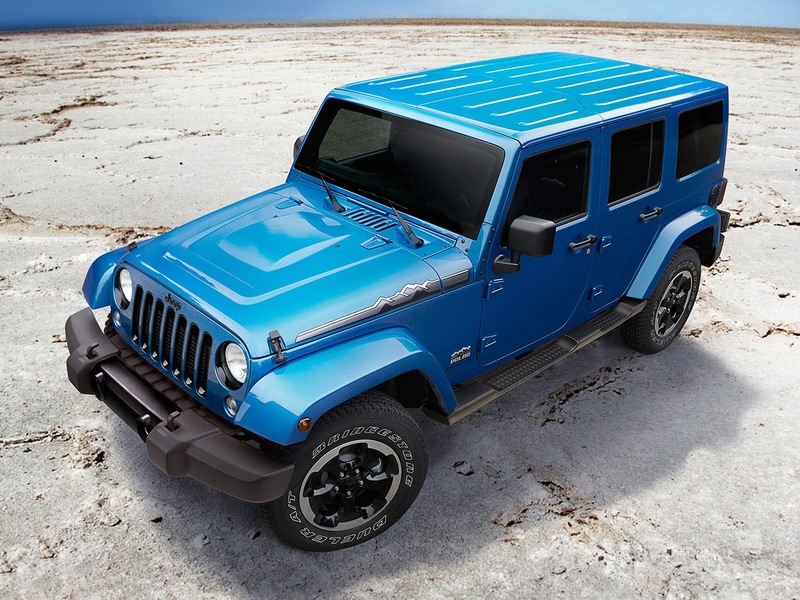 In addition to an all-new Hydro Blue, the Jeep Wrangler Polar Edition model is also available in Billet Silver Metallic and Bright White exterior colors. Engineered to take on the most challenging off-road trails and snow-covered roads, Jeep Wrangler Polar is equipped with the Dana 30 front axle and powerful Dana 44 rear axle. Legendary Wrangler capability is achieved through the standard Command-Trac NV241 part-time, two-speed transfer case with a 2.72:1 low-range gear ratio. 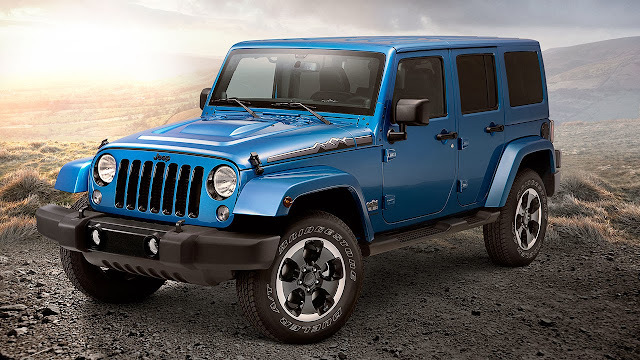 In order to handle any off-road track in utmost safety, the new Wrangler Polar model comes standard with the Trac-Lok anti-spin rear differential with an available electronic locking differential. The standard equipment for on-board comfort includes automatic climate control, leather-wrapped steering wheel with integrated controls, heated front seats, height-adjustable driver seat, Electronic Vehicle Information Centre (EVIC) and cruise control. The new limited-edition model will be powered by the award-winning Pentastar 3.6-liter V-6 engine that delivers 285 hp and 260 ft.-lbs. of torque and is paired to a standard six-speed manual or an available five-speed automatic transmission. Wrangler achieves up to 21 miles per gallon while still providing strong low-end torque necessary for easy off-roading.